Following on from CBD Food Festival, I’m happy to report that was not the only celebration of food that weekend in Birmingham City Centre. 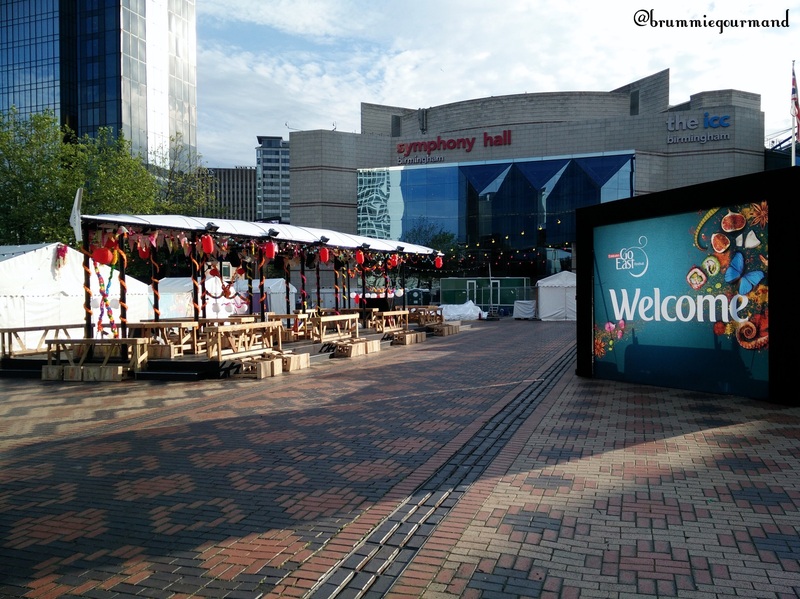 Emirates were cooking up all things eastern at the Go East Streetfood Market in Centenary Square between the ICC and The Library of Birmingham. Although we were stuffed from the previous two days, there’s always a little room in my heart (and my stomach) for streetfood. The event was well set up with multiple stalls offering a wide range of food from multiple cultures and a seating / performance area in the centre covered by an aircraft wing. Despite it drizzling at our arrival, the market was humming with activity. when we arrived with a lively performance of Sikh drummers rocking up a storm. First stop was the bar as Wifey fancied a little liquid refreshment to go along with the music. A good size bar with a wide range catered for most tastes. I plumped for a Tiger beer whilst Wifey went for a Kumquat Mojito. It was a little sharp and certainly took her mind off the drizzle for a while. With thirsts quenched, it was on to the food! First stop was our old friend StreetChef who was previously reviewed at Taste&Liquor at the Coffinworks on Fleet Street (sorry the picture isn’t better). StreetChef were serving their fusion style food with a red thai meatball wrap and a green thai chicken curry. Wifey & I shared a red thai curry meatball wrap. Served with a pipette of soy sauce, slaw and coriander popcorn. The look evoked memories of the quesadilla previously enjoyed at Taste&Liquor. The taste however was half a world away. The meatballs were well flavoured again, slaw was fresh, as nice and crunchy, and the coriander popcorn was much stronger on the flavour this time round and complimented the Thai style much better than the quesadilla. Next was onto Yum Jungle who were offering a variety of Pan-Asian cuisine. I was intrigued by a particular dish, the soft shelled crab burger whilst Wifey felt a little more full and went for a portion of Leek and Veg dumplings. Whilst we waited for our dishes, we went to sit down and the music swapped out to the gentle sound of traditional Chinese strings music. The leek and veg dumplings came with a rich slaw and chilli dipping sauce, I managed to sneak one away from Wifey. The crispy, light batter enrobed a nice ‘meaty’ filling which partnered well with the slaw. The burger was a beast and served in a crusty bap rather than the usual soft roll and loaded with the wasabi mayo slaw. The burger itself was SOOOO GOOD. It was my first experience of soft shelled crab and surpassed all expectations. Buried amongst the slaw in crunchy batter, the crab itself was soft, tender, meat had just the right amount of seafood flavour coming through and I was in heaven. Fries didn’t survive long enough for picturing but were hot, crispy and fluffy. To finish, we were looking forward to a spot of ice cream from Yee Kwan, however, it looked like they and a few other stalls had been Saturday only. Oh well maybe next time. Shortly after Yum Jungle was done and dusted, the heavens opened and we made a dash for home, bringing a quick end to our visit. Go East was a great finish to a foodie weekend, full of dishes and the need for an elastic waistband by the Monday!